Salvation And Survival: Blasphemy Unbridled! I've had enough! I've suffered long enough through Bill Maher's intolerable and arrogant tirades against those of us who believe in conservative values and religious morality. But now he's crossed a line that I didn't think he could even stoop to. The Washington Post quoted Mr. Maher -- by the way, why is he labeled "Comedian" Bill Maher? There is nothing the least bit witty or funny about the man -- in a despicable and profane diatribe against my God. I cannot let it go unanswered. It all centers around the story of Noah's Ark and the upcoming movie of the same name, starring Russell Crowe. First of all, this self-important little man deems to call this country "Stupid, when 60% of the adults living in it think the Noah's Ark story is literally true." He then manages to insult the three major religions in the world (Christianity, Judaism and Islam) in one sentence. I'm sure he's proud of himself! He then proceeds to educate his audience that we are four centuries past the "Scientific Revolution", (and after the advent of his god Capernicus), and humans, through science, realized that they can get a real answer to almost every question about our world, like "Where does the Sun go at night?" Maybe a better question, Bill, would be this ... Can you explain how the Sun has followed the same route day in and day out, through the centuries ... and yes, far longer than before your precious Scientific Revolution? But back to Bill's irreverent rant, and this is difficult for me to even repeat, but I will not protect him from taking responsibility for his profanity: "Hey, God, you're kind of a (expletive) when you're in a movie with Russell Crowe and you're the one with anger issues." The audience thinks that's just hilarious. His next brilliant statement: "And then its God's genius plan to repopulate the world with a new crop of (expletives) who pissed him off the first time. And then he kills millions more! Why are we getting our morals out of this book? Why do people follow any of it?" And then he thought he'd be culturally relevant and mention the Lenten season: “I’m reminded as we’ve just started lent, that Conservatives are always complaining about too much restraining regulation and how they love freedom, but they’re the religious ones who voluntarily invent restrictions for themselves. Jews wear black wool on a hot summer day; Mormons can't drink hot chocolate on a cold winter night ... isn't life hard enough without making rules up to (expletive) with yourselves? Don't we have enough rules and (expletives) to kiss, without making up new ones?" It was painful to sit through the five minutes of the video and watch and hear this soulless man vilify my God and spew such hateful language. It's painful because this man's sick humor is tolerated and even applauded by millions who do not have a clue Whom they are offending. And they do not understand that they can denigrate this story as silly and fabricated all they want, but it was people just like them that received the judgment of the Flood. I imagine that those who were wiped from the face of the earth were just as smug and complacent as Bill Maher and his devotees; enjoying living without all those "moral rules" that Bill thinks are too restrictive. 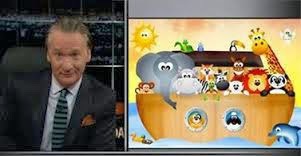 But Mr. Maher should take into account that Genesis is not the only place in the Bible that Noah's story is referenced. Because you see, we Christians believe there is ....gasp ... a Son of God! And He tells us in Matthew 24:38-39: "For as in those days before the flood they were eating and drinking, marrying and giving in marriage, until the day that Noah entered the ark, and they did not understand until the flood came and took them all away; so will the coming of the Son of Man be.…". So, Mr. Comedian, you might not understand why I choose to get my morals out of the Bible or why I try to follow all of it, but I don't expect you to. As long as you are your own little "g" god, there is no hope that you will comprehend how, or why, I have come to the understanding that I need a Savior to keep from becoming like you. As different as we are, we share one thing in common ... there will be a day when each of our bodies will die, and we will each have to stand before the One you have blasphemed with such foul and disgusting names. When it is your turn to stand before the One that created you, I have a feeling you won't be getting many laughs from that audience! So go ahead and get them now, while you can; because unless you change your heart, [where you're going] is going to be a real tough crowd. Hebrews 10:29 "How much worse punishment, do you think, will be deserved by the one who has spurned the Son of God, and has profaned the blood of the covenant by which he was sanctified, and has outraged the Spirit of grace?" I believe it was said......"For every knee shall bow"...........That includes you Mr. Maher! These are the people like Mr. Maher who are fools and they shall wrestle in their anguish when they see the truth. It's a sorrowful state that our world is living in and especially when people watch and entertain themselves with this sort trash. There are many like this man amongst us and encouraging others to their ungodly beliefs and entertain themselves by trying to belittle others. Satan works in many ways, doesn't he? We know that Satan is the ruler of this world, but only because God allows it for this time. There will come a day, as you suggest, when "every knee shall bow".... and it will be to the very God that Mr. Maher has slandered. Maher is brave now in his ignorant speech, but do you think he will dare to be so "funny" as he faces His maker? Watching his rant made me extremely angry. It was uncomfortable and gives me a twisted feeling in the gut. These horrible things are said about our God and we arent supposed to be upset because it was "comedy". Yet if we had a public figure attack their beliefs (whatever they are) in such a disgusting manner, that person would lose jobs, get dragged through the mud and their lives turned upside down. This liberal culture is excepting of all expect if you disagree! Yes, I can identify with the twisted feeling in the gut ... that is the Holy Spirit grieving within you and you reacting to an emissary of the Enemy spewing his filth. I try to feel empathy for what he will encounter one day, but it's hard to get past the anger. We need to pray that this man's heart will be changed and his soul saved. You're right -- He has accomplished his goal, but it is also my privilege to stand for my God in righteous anger and defiance of his foolish rant. Too many are silent in the face of this public irreverence. And yes, he deserves our pity, but we also need to pray for this man's soul; it is in real danger of spending eternity in hell. We must all continue to "Fight the Good Fight of Faith" as exhorted in 1 Timothy 6, and keep the commandment (to "Love our God with all our hearts, souls, minds and strength") unstained and free from reproach until the appearing of our Lord Jesus Christ. To Him be honor and eternal dominion!